[The Daily Barometer, Jan. 10, 2012] — Whether living on campus and using the dining centers or in an off-campus apartment making food for themselves, it is assumed college students don’t know the first thing about cooking. That is exactly the idea she brought to Cascadia when she was hired last summer. Prior to working at Oregon State University, Ulfersworked at the First Alternative Food Co-op in Corvallis and was a general manager for the two stores they have. She brought all of the information she gained there to Cascadia and has helped expand it into what it is now. Last year, Cascadia was located next to Arnold Dining Center and was only about half the size it is now. 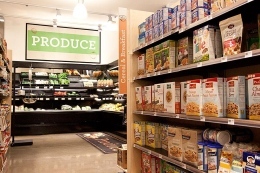 “When we were going to do the remodel, I had my staff look at our history, and took the last 200 top items [that we sold], and we bought about 25 of them,” said George Coulter, food and beverge area manager at Arnold Dining. For this coming term, Coulter said what they carry now will be based on what they’ve learned over the course of fall term. As well as all of the information that Ulters brought. Cascadia carries fair trade chocolate candies, nut blend candies, as well as wheat- and gluten-free products. Just walking into the store, there are many obvious choices that are not available most other places. “Hopefully next summer I can bring in some more local produce,” Ulfers said. Another one of the big things Cascadia offers that other places on campus don’t is produce. There is a large selection coming from various sources. “Sources have been Oak Creek Farms, an organic farm managed by OSU Horticulture; Red Hat Melons, a local farm who provides melons, pumpkins and squash; Riverwood Farms, local grower who provides apples and pears; and Pacific Coast Fruit in Portland who sources products both locally and otherwise,” said Rich Turnbull, associate director of University Housing and Dining Services. Read the full story at The Daily Barometer. Article by Gwen Shaw. Photo by Vinay Bikkina. This entry was posted on Tuesday, January 10th, 2012 at 10:56 am	and is filed under Dining, Orange Rewards. You can follow any responses to this entry through the RSS 2.0 feed. You can leave a response, or trackback from your own site.